Some men like to maintain short hairstyles but that means a trip to the barber every three or four weeks. The barber isn’t as cheap as he used to be as inflation caused rising haircare expenses. Many men are on a tight budget but always need to look their best. The Philips brand has provided an affordable solution to your problem, and places the control of your hairstyle in your hands. So, if you’ve ever suffered from a questionable haircut, now you can purchase the Philips Norelco HC7452/41 7100 Hair Clipper and trim your own hair. The Philips Norelco HC7452/41 7100 is cordless and rechargeable, but can only be used for dry clipping. 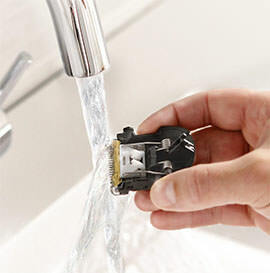 However, you can remove the head of the clipper and rinse it under the tap, which makes for easier cleanup. The titanium blades are fully washable. You can choose to use it cordless, or operate it with the cord plugged in. There is also a battery light indicator so you know how much power is left. The Philips Norelco HC7452/41 7100 Hair Clipper has a unique shape that you won’t find in other comparable shavers. This shaver is made with black and silver plastic. It’s tapered in toward the middle, so you can grip it more easily in your hand. It has some fine lines as part of the front of its design. 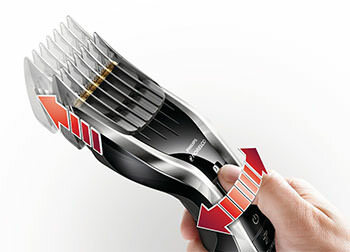 The entire shaver also curves backwards, which not only better enables it to be held in the hands but also places the cutter at the top of the shaver at the perfect angle for trimming hair. 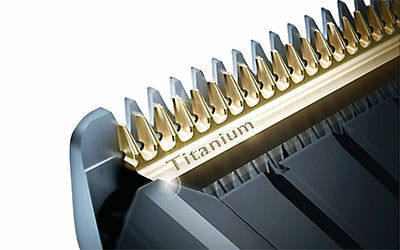 One row of the blades is made from gold titanium metal for strength and sharpness. These blades are self-sharpening, so the clipper will last you for many years. The blades are also protected by a robust steel guard for durability. 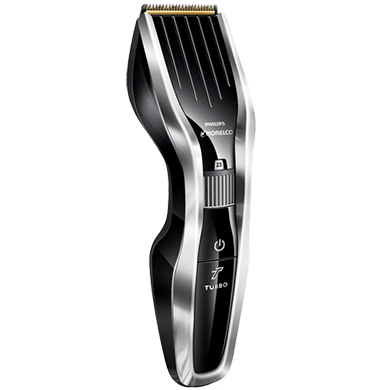 The Philips Norelco HC7452/41 7100 Hair Clipper is made with DualCut technology so that its blades cut twice as faster as other brands. The cutting element has been doubly sharpened. This enables it to reduce friction while trimming. 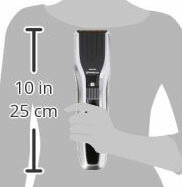 Men can also use this hair trimmer for other parts of their body too, to keep hair neat and tidy, or to stay cool in the summer. You can also choose which length of hair you want to trim down, as there is a numbered dial about halfway down the middle. There is one plastic comb attachment which expands the usefulness of this shaver. You only need the one, as this has twenty-three different length settings. The settings start at 1/64th of an inch and go all the way up to 7/8th in length. The combs will move up or down depending on which length you turn the dial to. The dial turns left or right. There is less hassle when you only have to deal with one comb, and fewer chances of losing one in the drawer. The comb locks into position so you won’t have to worry about it coming loose when you’re shaving. 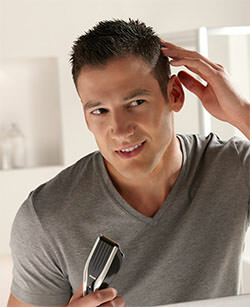 If you don’t want to use it with the comb, the trimmer will shave down to .5 mm or 1/32nd of an inch. The on/off button is located on the bottom three quarters of the clipper. Under that is the Turbo logo. This clipper is rechargeable, and runs on a lithium-ion battery. It takes a one hour charge which will give you up to two hours of shaving time. 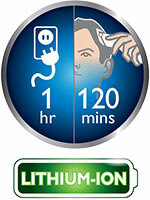 This is quite impressive, as often hair clippers only have a forty-five minute to one hour charge. This also makes them perfect for taking on an overseas trip where the outlets and the plugs differ. There is also the Turbo boost power which will speed up trimming time. Simply press the turbo boost button located under the main on/off button for a surge of additional power. This is perfect for those who have thick hair. The motor built within the Philips Norelco HC7452/41 7100 has been built to last for many years. It has also been engineered to provide the best performance, and has been designed to provide low-friction, which is what can slow down the best of hair clippers. The clippers are actually a bit larger than your average hair clippers. 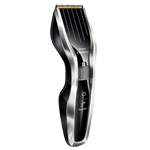 The Philips Norelco HC7452/41 7100 Hair Clipper measures 10 inches tall, or 25 centimetres tall. 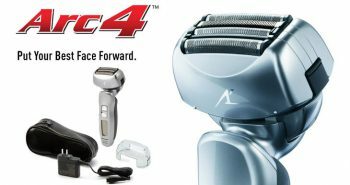 The Philips Norelco HC7452/41 7100 costs under $32, so it’s an affordable addition to a man’s bathroom grooming kit. In the kit you’ll get one Philips Norelco HC7452/41 7100 Hair Clipper, a power cord/charger, one plastic hair comb, a storage case, and a cleaning brush. You don’t need any oil to run the shaver. 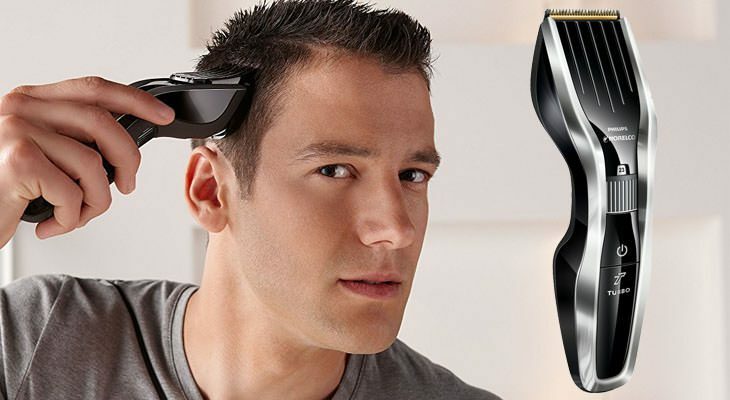 If you’re the type of man who needs to be control of your hair styling, the Philips Norelco HC7452/41 7100 is a quality but affordable choice for you.